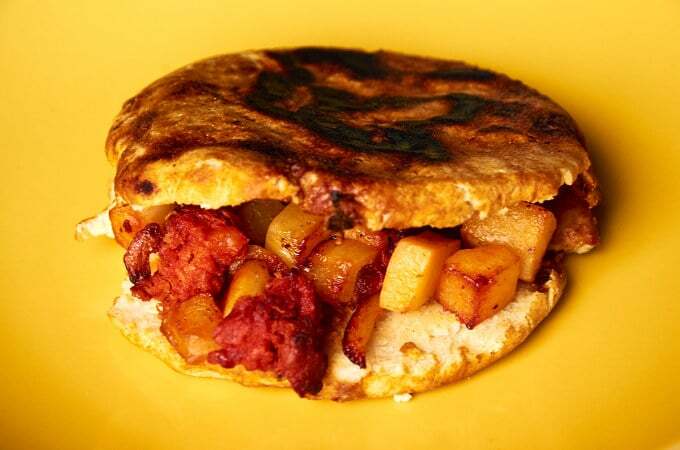 Potato and chorizo guisado is great for filling gorditas and tacos. Preparation is super simple and it’s packed with flavor. The word guisado roughly translates as “stew” but think of guisados more like cooked fillings that are prepared in a pan or a pot. Here we have served our guisado with Tia Vicky style gorditas encarceladas. This guisado couldn’t be simpler. 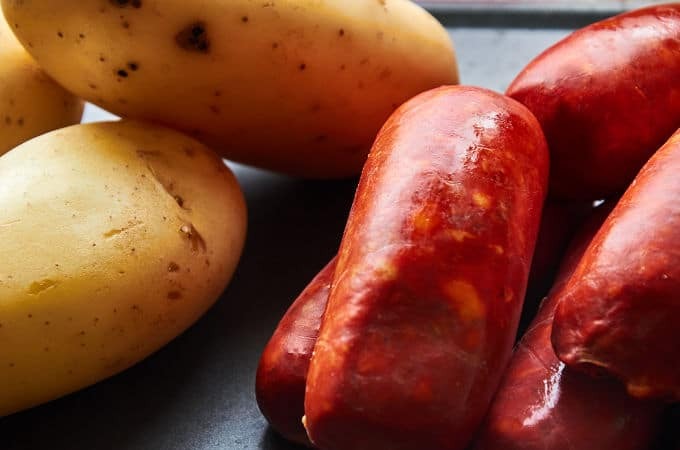 You need 3 medium white waxy potatoes, 1/2 pound of Mexican chorizo, cooking oil and a pinch of salt. Start by removing the outer membrane from the chorizo. 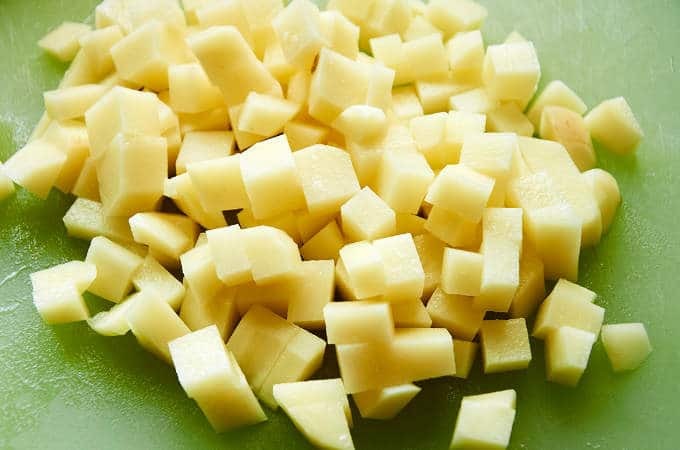 Peel and chop the potatoes into 1/4″ cubes. Over high heat, brown the chorizo for 1 minute until it starts to release its fat. 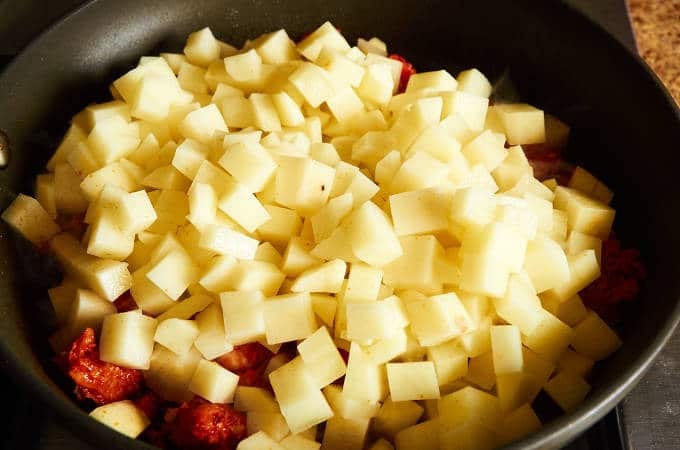 Add the chopped potatoes to the pan. Cook for 15 to 20 minutes stirring occasionally. Be sure that the potato is cooked thoroughly and is lightly browned on the outside. Add salt if needed. This is how it should look. 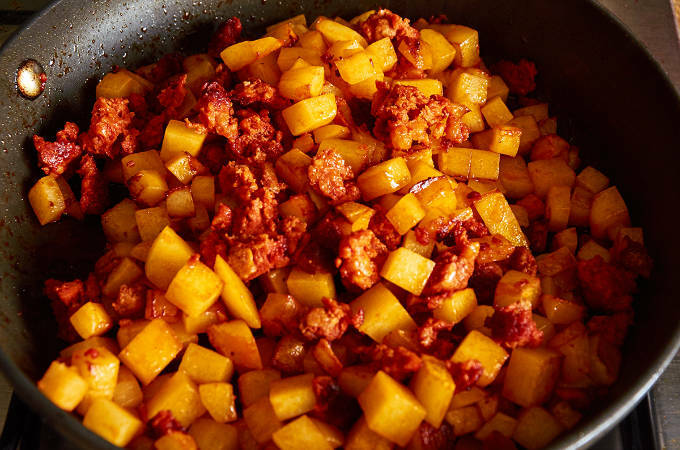 Potato and chorizo guisado, great for stuffing gorditas, filling tacos and topping huaraches. As simple as it gets. 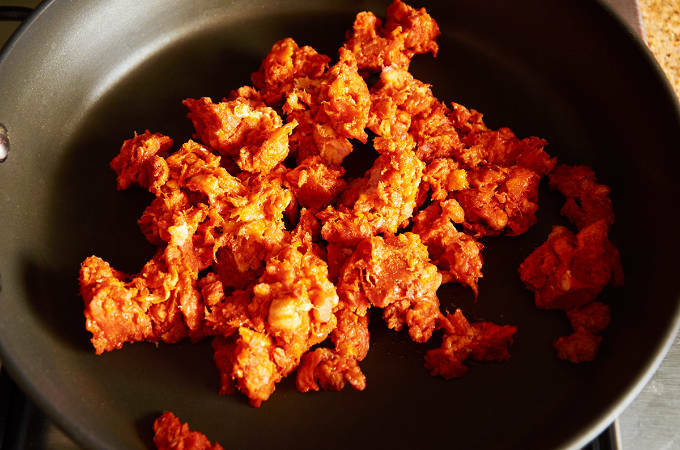 Add the chorizo to the pan and cook for 1 minutes until the starts to brown and release its fat. Add the potato and cook for approximately 15 minutes. You want the potato to be fully cooked and lightly browned. Salsa verde is a great complement for any dish that uses chorizo and potato. 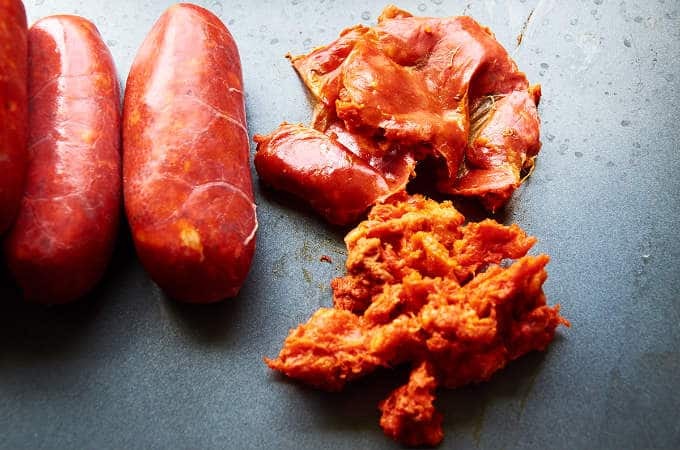 This guisado will keep for 3 days in the refrigerator if you have any left over. Thanks for pointing that out. It’s definitely 1/2 pound of chorizo. Cool recipe! I don’t cook with chorizo often but this looks good. What is the gordita bun you used? It look’s good.